Are you looking to eat better in 2017? Many of us have gained a few pounds enjoying holidays with friends and family. We love our familes and we love to eat when we are together, and this is just fine. But now the jeans don’t fit like they used to. Copano Blues shrimp are a good choice for heathly eating. Copano Blues shrimp have just 120 calories per 4 oz raw serving. That is less than 30 calories per extra jumbo shrimp, based on 16-20ct extra jumbo Copano Blues. Go ahead, eat the shrimp, and enjoy healthy eating. 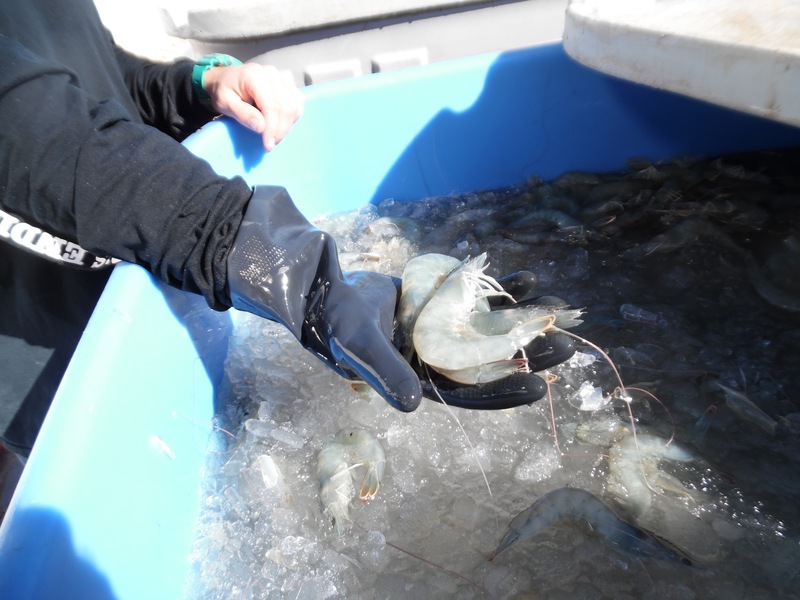 Execitive chef of the Hilton Americas in Houston, Ruffy Sulaiman toured the Copano Blues shrimp farm recently. This was the first chance Chef Ruffy had to sample Copano Blues. His verdict? “Delicious”. 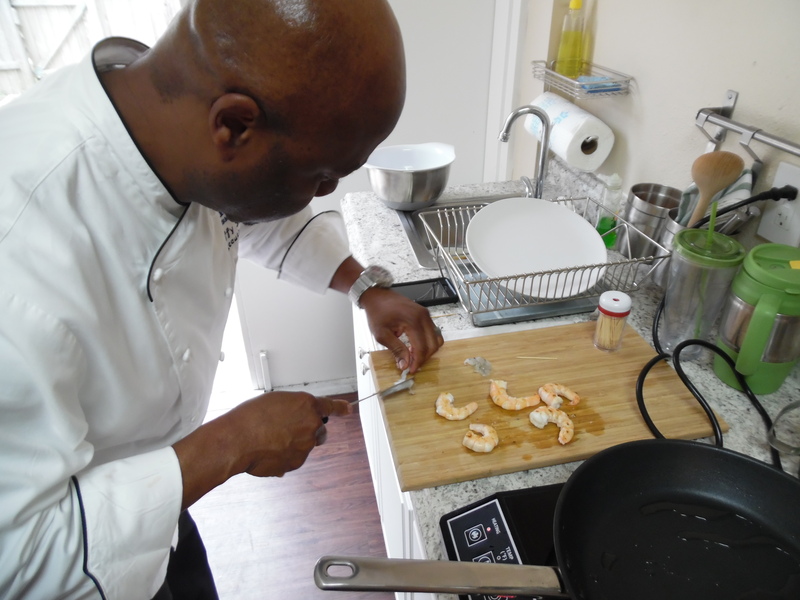 Chef Ruffy had never tried sashimi shrimp, because he does not have access to sashimi grade shrimp. Chef liked the raw sashimi Copano Blues even better than cooked. 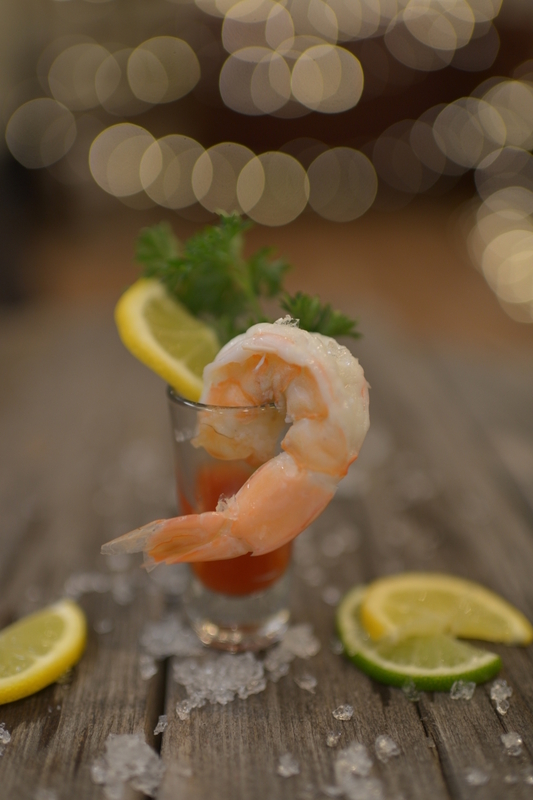 “The cooked shrimp are sweet, but they are even sweeter when raw”. Chef Ruffy was impressed with the firm texture of Copano Blues shrimp. “These are great shrimp”. This was Chef Sulaiman’s first tour of a shrimp aquaculture facility. Chef was pleasantly surprised to learn about our great concern for animal health and that no animals are harmed by the farm. Unfortunately, we have spoiled him. Chef Ruffy will not find another shrimp farm of this caliber anywhere. Today, Monday November 21st, is world Fisheries Day. Let us take a moment to appreciate our fisherman and the fishery communities for all they do to provide healthy aquatic protein for us and our families. Take time to think about the many people involved in fisheries. 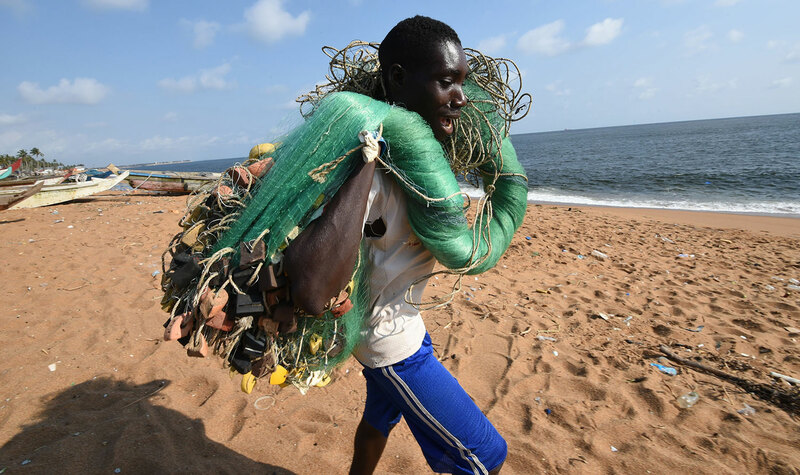 Yes, it starts with the fisherman, but so many others are critical to responsibly harvesting our natural marine resources. Fishermen are just the tip of the iceberg. Fisheries managers and scientists track the harvests, biomass, and environmental impacts to make sure harvests will be available for generations to come. The Coast Guard protects our fishermen. Boat manufacturers build the boats. Many build everything that goes on the boats including engines, electronics, windows, gear, nets, bunks, and decking. What about the essentials that fisherman require for every trip, from bait to ice, to food and water, to fuel? Then think about the other end of the trip. Fishermen offload the boat thanks to lumpers and dock workers. Seafood processors hire people to cut, fillet, skin, ice, and pack the bounty. Truckers and logistics experts rush seafood to distributors, restaurants, and supermarkets. It is kind of amazing to think of how many people are involved in managing, harvesting, and distributing our fisheries resources. We thank our fishermen for risking their lives to provide food for our tables. We thank the many others that supply fish and seafood for our families. Thank you. World Fisheries Day is your day. At Sustainable Sea Products International, we have a triple bottom line philosophy. Everything we do must financially support our shareholders, but equally important, what we do must be good for the environment and the people we deal with. We believe in fair and modest profits for everyone in the supply chain, from farmers and fishermen, to distributors and processors. And we believe in fair value for quality products for end users. We believe that responsible aquaculture is an important way to preserve our natural wild fisheries. By providing responsibly raised seafood in land based recirculating farms, we provide high quality seafood with low environmental impact. We help take pressure off of wild fisheries by helping supply the demand for healthy seafood. Thank you for working with us. We are harvesting beautiful Copano Blues shrimp every week now. The quality of the shrimp could not be better! Our proprietary harvest system is built right into the farm. The harvest process is quick, humane, and effecient. The shrimp are harvested in a stress free manner. Traditional shrimp ponds may have a stressful harvest process which can cause soft shells and impact the flavor of the shrimp. Copano Blues shrimp go from swimming in perfect warm water salt water, directly into a chilled ice slush bath. The chill tanks are then placed on a refrigerated trailer and rushed to a shrimp freezing facility about one hour away. This ensures the quality is always outstanding. Seven star Michelin Chef Yoshihiro Murata (in the white shirt and dark jacket) visits the Copano Blues shrimp farm in Taft Texas. 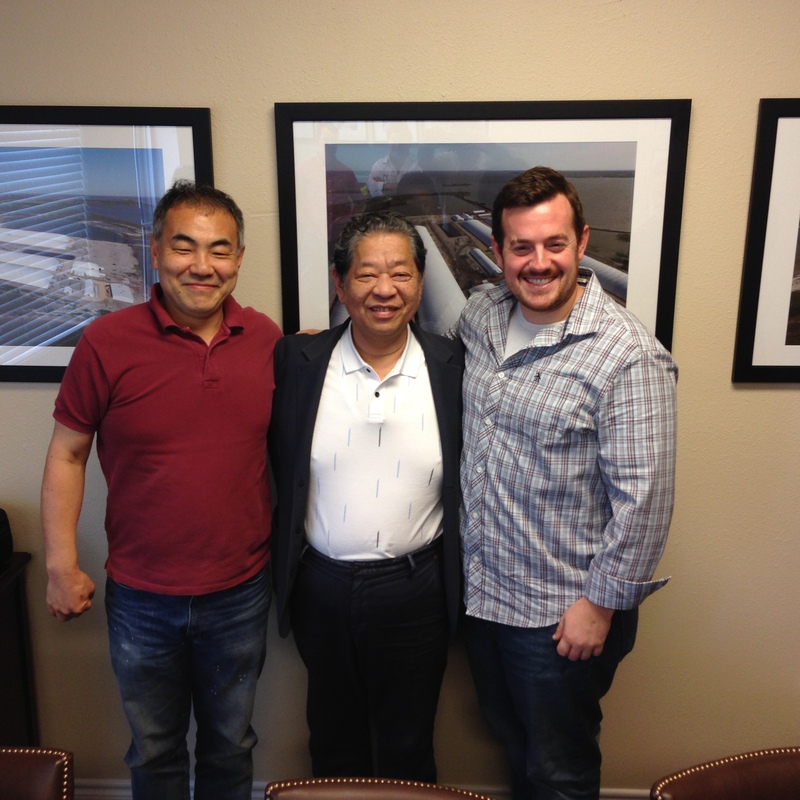 Chef Murata traveled over 12,000 miles to tour our biosecure farm and taste our shrimp. Chef was very impreseed by the firm texture and clean flavor of Copano Blues shrimp. He sampled them raw, pan seared, and cajun boiled.